You can easily embed a Pinterest profile, board or individual pins by pasting their URL into posts and pages. 1. Copy the profile, board or individual pins URL from your web browser’s address bar. 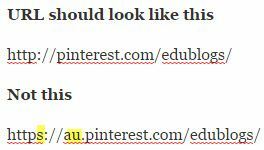 It also won’t embed if your Pinterest URL is https or includes your geographical location in the URL. We have published a step-by-step guide on how to embed pins or boards on a page, post or sidebar on your blog.